Of all the various shapes of houses, roundhouses have always been one of my favorite. Like domes, they create maximum floor space with minimal wall material, but roundhouses are simpler and easier to build since the walls are vertical. And because roundhouses are protected by a roof, they are suited to a wider range of climates than domes. Combining the efficiencies of roundhouses with the benefits of earthbag building enables virtually everyone to afford their own home. Earthbag building is a simple construction method using bags filled with soil, gravel or insulation, such as volcanic rock or perlite. The bags are stacked in level courses and tamped solid. This method of building has evolved from the military's use of sandbags for constructing blast and bullet proof structures. Modern-day builders are constructing beautiful homes, shops, offices and schools throughout the world as word spreads of its many benefits. 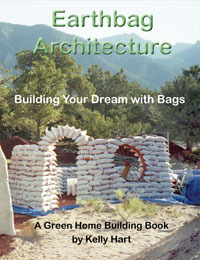 Earthbag buildings are sustainable, low-cost (literally dirt-cheap) and simple to build. Even unskilled workers can learn each step of construction in a few moments simply by watching. Properly designed earthbag buildings are resistant to mold, fire, hurricanes, tornadoes, earthquakes, floods, insects and rodents. In addition, earthbags can be used to build almost any building shape in any price range with just a few basic tools. The roundhouse building method outlined here is suitable for structures up to about 30' in diameter without requiring additional support. Earth-berming - banking earth against the walls and sloping it away from the building - will improve energy efficiency and help reinforce the structure. The first step is to clear and prepare the building site. Remove topsoil and save for landscaping or gardening. Drive a center stake and outline the perimeter using a length of twine or chain. Assuming the use of an interior plumbing wall (2"x6" is the easiest), bury your plumbing before proceeding. Then dig a trench a little wider than the walls and fill with gravel, rocks and/or broken concrete up to about 6" below grade. At this point, start placing gravel-filled earthbags - double bagged for added strength - for the first few courses (at least 6" above any risk of moisture). Add one or two strands of barbed wire between each course for tensile strength and to help hold bags together. In cold climates, fill bags with scoria, pumice or other suitable insulating material to improve energy performance. Once your walls are safely above any threat of moisture, you can begin placing bags of earth. Use a mix of about 25% clayey soil to 75% sandy soil. Fill each bag about ¾ full and then tuck the bag end underneath itself. Tamp the bags solid once a course is complete. Check for level, add barbed wire and repeat. Install door and window forms made of scrap wood, barrels, tires, etc. Arched or flat openings are both possible. Form and pour a reinforced concrete bond beam on top of the wall. The easiest way to build a round roof is to radiate peeled wood poles or joists from a center pole. For the price of a $15 firewood permit, all the wood can be gathered sustainably from overcrowded forests. In cold climates, add ceiling poles and roof poles with space between for insulation. Another method is to build a stone, adobe or compressed earth block (CEB) column in the center. Add an adjoining wood stove or rocket stove for low-cost, efficient heating. Alternative roof ideas: One good option is a green roof design like Tony Wrench, author/builder of That Roundhouse ( www.thatroundhouse.info ). His reciprocal roof design does not require a center pole or column. Roof poles interlock and are self-supporting. Straw bales, which serve as roof insulation, are protected by a waterproof membrane. The final roof of native grasses and wildflowers is stunning. Another way to avoid a center support is to run steel cable through radiating rafters and secure with turnbuckles. Annealed nylon in the holes allows the cable to slide and adjust into position. Other options to consider: Incorporate passive solar design to improve daylighting and space heating. Extra windows on the south and southeast, and fewer windows elsewhere will increase energy efficiency. Add a composting toilet, greywater oasis, organic garden and built-in furniture. Use deep window sills for growing plants. For a more thorough look at how to build an earthbag roundhouse with many pictures, see this page.